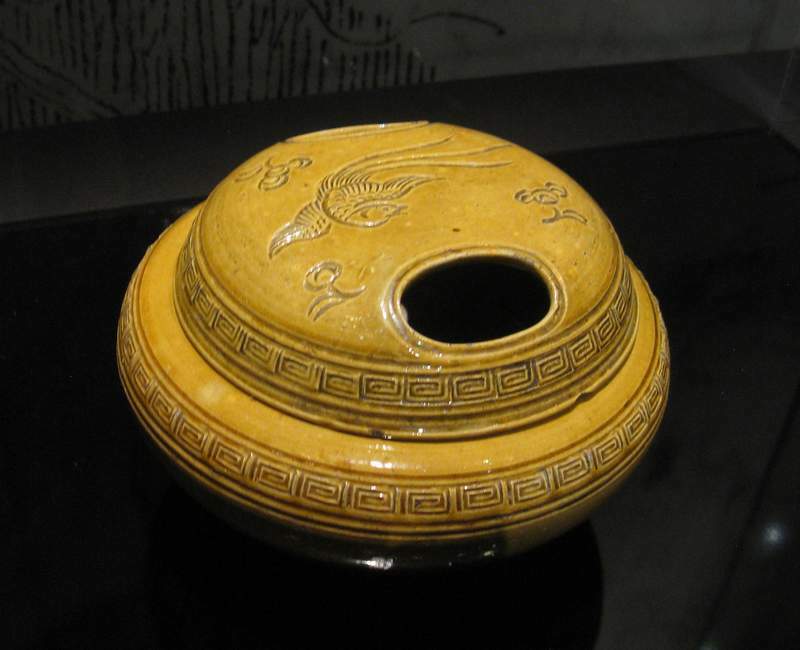 Description: this Incence burner could have come from ancient India. 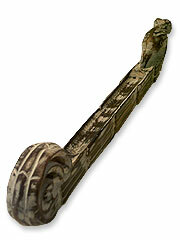 The carved wood represents a bird’s head at one end and his beautiful plumes on the other. Approximately 12"" long." 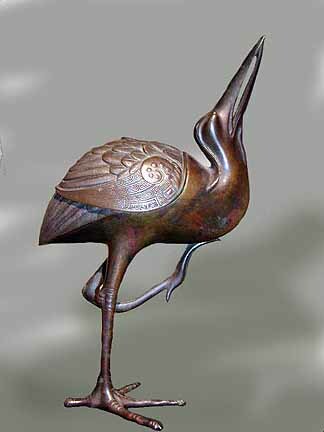 Description: Japanese bronze incense burner in the cast form of a stylized egret standing on one leg with the left leg extended up and forward, the head held back with the long beak pointing heavenward, the body serves as the incense receptacle with detachable wing cover having individual feather and key fret border detail and the main smoke aperture being the mouth. 10 in. high. 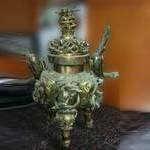 Description: Bronze Incense Burner, unknown date [thought to be mid 19th century], unknown origin [Chinese ???] with six decorated panels, divided by six organic, flattened masks, and with heavily decorated feet. Lid: A small bird wresting from flight upon a prunus branch, showing two open blooms. Height, 19cm [7 ½”] Cones and/or sticks can be used with this object. There is a seal on the base. Description: The burner measures 24 1/2" in height x 12" wide, and weighs 26 pounds. 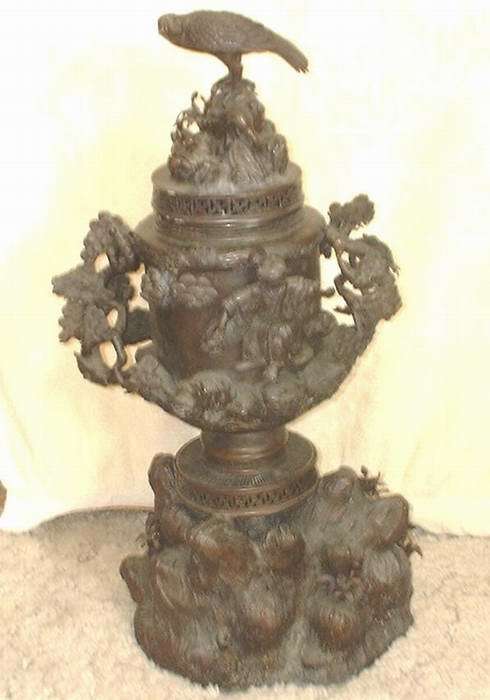 There are dragon like animals, flowers and carvings of individuals. It is topped off with a bird. This burner is in 5 sections. 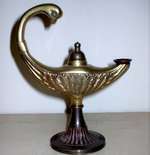 Description: While technically not an incense burner but a lamp, the bowl-shaped wick holder of this item was used for the introduction of scents. 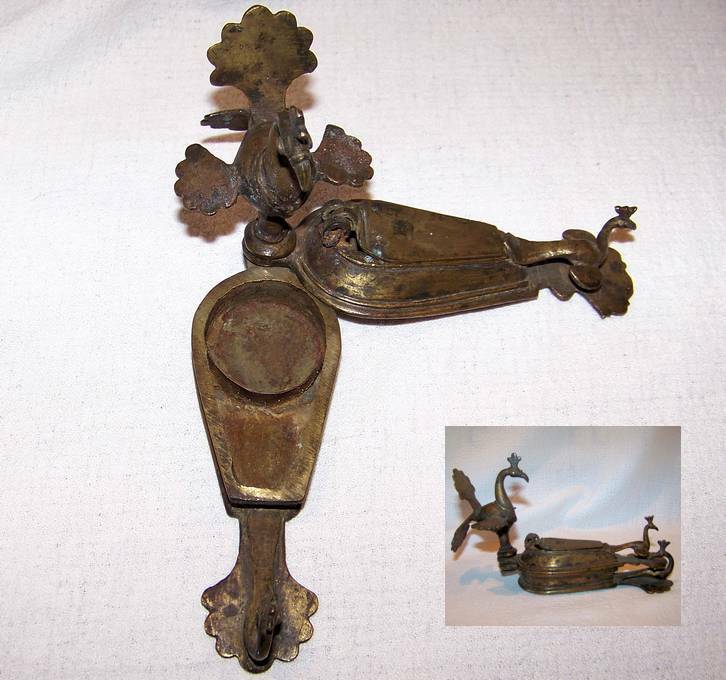 It is made of brass with traces of pigment (whether paint or enamel) in the fluting of the foot. 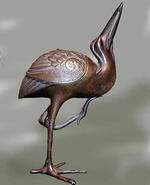 It stands 6 1/4 inches to the highest arc of the bird headed handle. 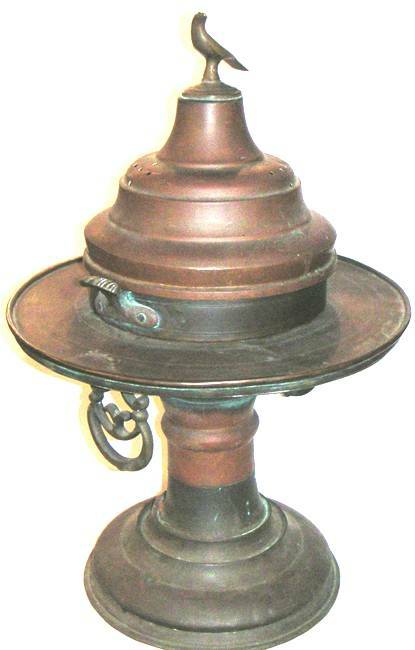 Description: This burner stands 2 3/4" tall to top of finial, 2" wide and 2 3/4" across oneway and 3" another. 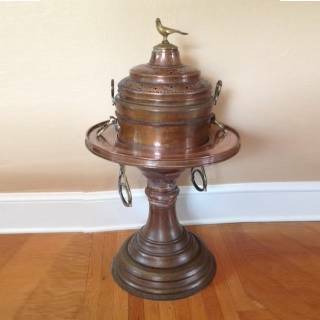 Made of bronze with original patina. Triangle shape with 4 legs and bird finial. 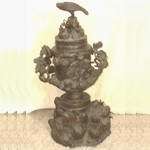 Description: The bird has many hiding places and seems to be made of cast iron on a marble base. This item could alo be an ash-tray ? Description: This Incense Burner stands 27" tall to the tip of the bird. 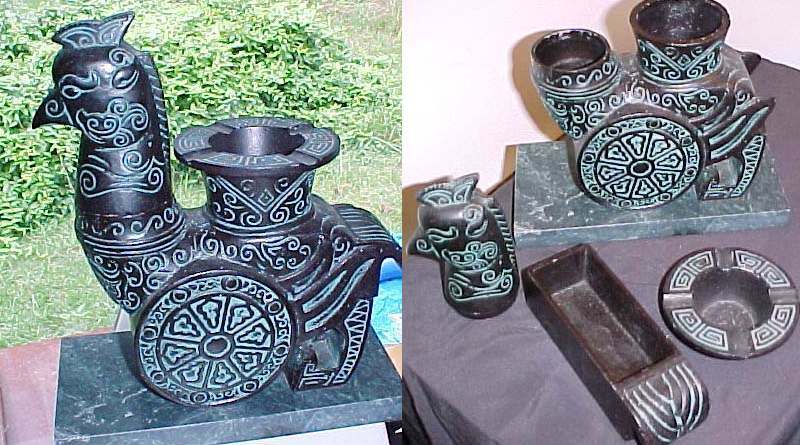 The tray is 18" wide, the base is 13" and the bowl/vessel is 5 1/2" deep and 11 " across. It has a white, crusty residue in it. 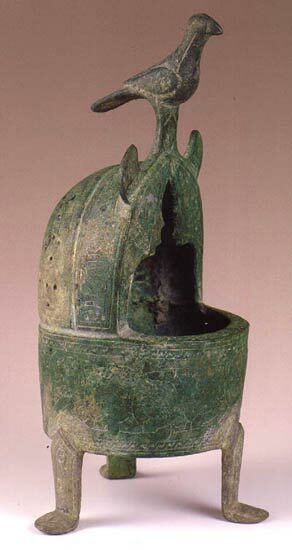 May also be a heating or cooking brazier. 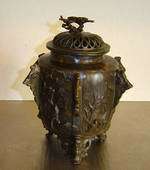 Description: Manufactured in Awa (Tokushima prefecture), decorated with the mythological bird Hoo (japanese phoenix). Description: Oil lamp with a bird as lid. 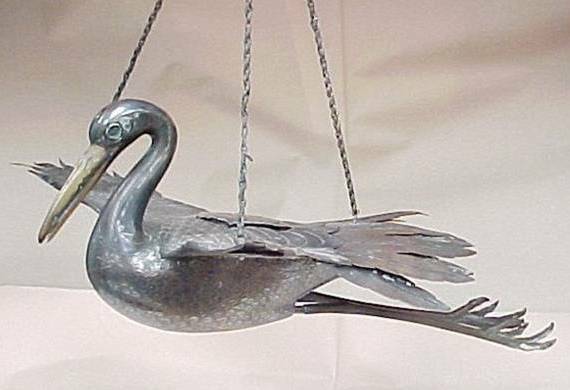 Description: Sterling silver and bronze figural crane. 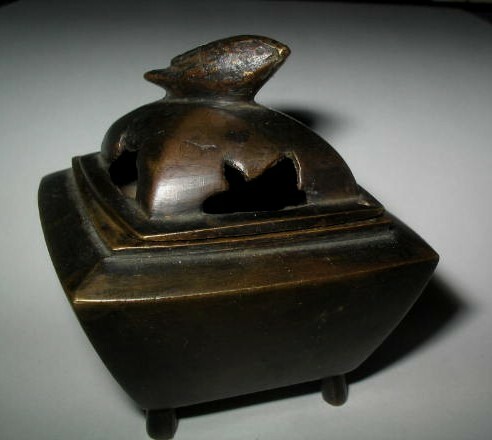 It is a Censer style incense burner with holes for the smoke to escape between the feathers on the lid as well as through the beak and a single hole on the top of the head. The legs are bronze and and can be removed. The tail feathers can also be removed. 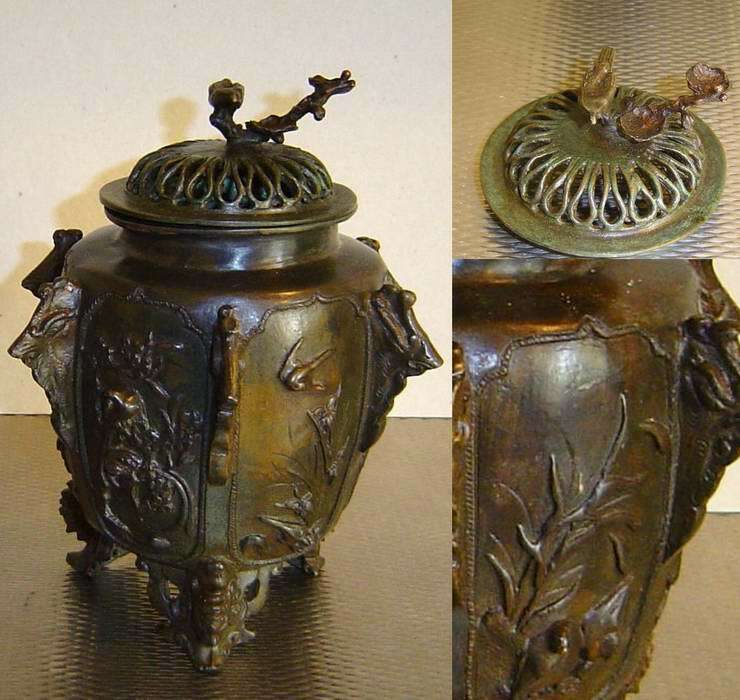 Description: Bronze pot, about 18 inches tall, with complex relief decorations and bird shaped handles. 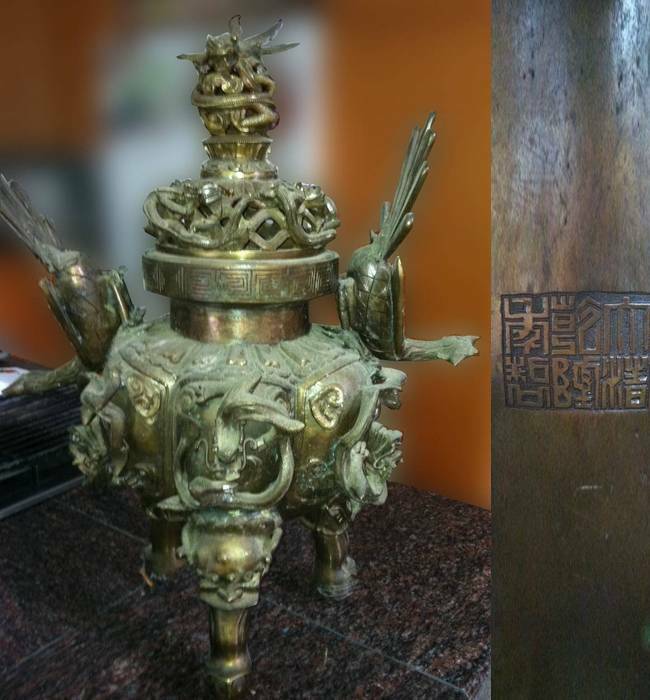 Qing dynasty marks on the bottom. Description: This Burner stands 1 meter tall to the tip of the bird. 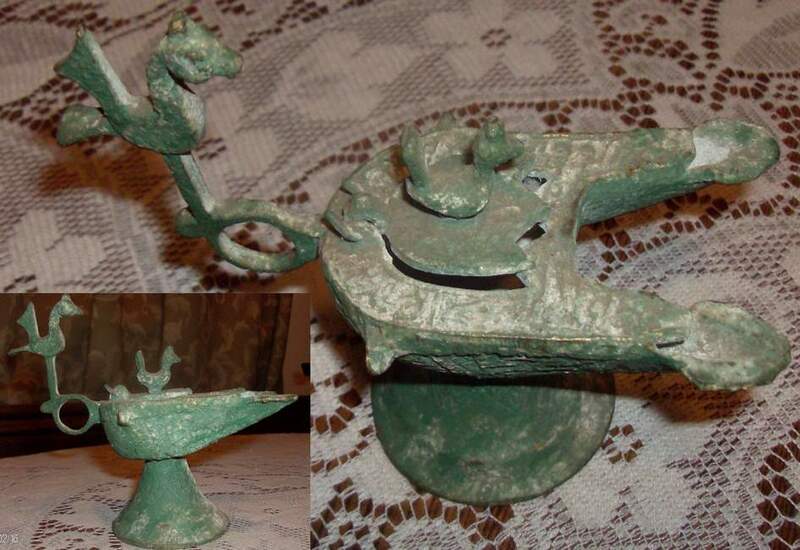 May be a heating or cooking brazier.